An all-time favorite flanger in a new compact chassis with many improvements to maintain your signal integrity, with the crazy Filter Matrix mode. The flanging is as high-quality as it gets, & the Filter Matrix mode opens up an entire new world of possibilities that you'll absolutely find use for. Though they're sticking to their classic build, I think they could have easily added a Regeneration control for some additional intensity options. The old school classic from the 70's is back with all hiccups fixed, still built to last, still creating a wide range of sounds you've come to know & love. You can get a huge range of effects from the manual controls, including all types of flanging, subtle choruses & vibratos, & even delay. This pedal could have been built in the standard pedal shape & size, which would be nicer on a pedalboard, but it's not a big deal. An even simpler version of the sought after 80's original, the Micro Flanger trims all the extras to help you save money & focus on what matters. MXR has dropped out the Manual & Depth knobs (setting them to sweet spots) so all you deal with is the Rate & Regeneration. Having only two controls is a convenience, but players who like to customize their sound to a high degree may want more options. The best flanger pedal can take your standard, vanilla tone and turn it into a thick, otherworldly sound that contains within it a captivating wooshing effect guaranteed to keep the audiences attention glued to your guitar. Whether used in a subtle or obvious fashion, this is a classic rock effect that immediately adds some spice and variation to your playing. We modern guitarists are lucky. Flanging used to be a nightmare of manipulating reel-to-reel machines, but today it can be achieved in analog or digital fashion all from a small stomp box situated at our feet. This means we can now use it during live performances, too. Most listeners couldn't tell you what the flanger effect is called, but they know it when they hear it. That weird comb-filtering sweeping up and down the frequency spectrum comes from a variable notch filter changing the time-delay of a copy of the original signal. The result is an other-worldly swooshing that people associate with the sounds you hear coming out of a drain pipe or from a jet plane flying by at high speed. Since it was used by many of the psychedelic rock bands of the 1960's and later, like The Beatles, it's become a staple in every guitarists pedalboard, especially in any of the rock sub-genres, but keyboardist and synthesizer players get great use out of it too. Today we'll look at the various features you should watch out for when hunting for a new flanger pedal and the best methods for using one. After that, we'll explore our top picks from the modern lineup that produce the highest quality and most reliable flanging effect. What is the Flanger Effect? Flanging is an effect created by duplicating an audio signal, delaying it by a relatively tiny, but changing, amount of time, and recombining it with the original signal. The changing amount of time is usually equal to or less than 20 milliseconds. By shifting the delay constantly, for example sweeping it between 0 ms and 20 ms, a comb filter effect is created that sweeps up and down the frequency spectrum. This comb filtering creates a series of peaks and nulls, separated from each other by a distance based on a linear harmonic series. The result is wooshing sound, often described as the sound of a jet plane passing by, that is musically pleasing due to the mathematical pattern created. This sound effect was originally created by a recording engineer pressing his finger at differing pressures on a tape reel to create the varying time delay. By the 1970's we began using solid-state electronics to emulate the effect, which is now capable of being reproduced using digital processors. 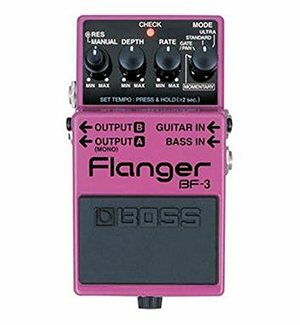 Flangers should not be confused with phaser pedals in which the phase is varied instead of the delay. They can sound similar to the untrained ear. What to Look for in a Flanger Pedal? There's one rule for flangers: Don't cheap out too hard. While most pedal types now have access to common electronic components of higher quality where the demand drove the prices down, you still need to jump past the cheapest models here to ensure you get a reliable and quality sound effect here. True Bypass - You want an option that features a bypass that doesn't route your signal through the same electronics used to produce the effect. It will still color your signal to a degree, affecting your tone. You want a real deal bypass. Voicing - This refers to the quality of the effect. If you go vintage, you will actually get a vintage sound here, as opposed to a higher fidelity modern version. I'd go modern, personally. Stereo Functionality - Guitar is a mono instrument while many effects can be stereo, and flanger is no exception. If you choose one that's capable of outputting in stereo, make sure you can switch back to mono for playing in a band. Tap Tempo - You will definitely want the ability to tap in the tempo of the song you're playing so the effect will work in proper time and not sound out of place. Those are the four items I would consider when purchasing, with the first and last being the most important. 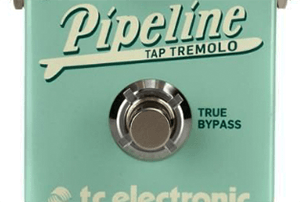 True bypass and tap tempo are non-negotiable features. They are must haves. Flanging is one of those crazy effects that can be out of this world on its own or even nuttier in combination with other effects. But let's not get ahead of ourselves. Let's take a look at where to use it in the grand scheme of things and how to configure the settings. Flanging would fall under the modulation stage of your signal chain, which would come after your compression, wah, pitch shifting, and distortion. You want it to take on the aspects of those effects but not that of reverb or delay, which needs to come after the modulation stage. In general you see four knobs, which are variations on the terms Speed, Depth, Feedback, and Time. Speed or Rate controls the cycle of the effect, moving from slower to faster. Depth controls the intensity of the effect regarding the amplitude of the waves of the notches. Feedback or Regen refers to looping the output back to the input in order to double flange, essentially. Time allows you to delay the space between the notches, whereas sometimes you'll see a Width knob to control the space of the notches themselves. And there are some that will feature a Manual or Res knob (for resonance) which is kind of like Tone in that it lets you emphasize parts of the frequency spectrum. Now that we've discussed which features to look out for and how to use flanger pedals in general, it's time to venture out into the marketplace to see what the best choices are for our money. We don't order these in any special way, but we do draw attention to our top pick as well as point out two other "best in class" options at the top of the article in the comparison table. Take the time to consider each, because if they made the list then they exceeded our expectations. The classic staple of 70's rock and funk is back. The MXR M177R Flanger Pedal never stopped being sought after, so MXR took the desired effect, fixed up any of the old problems with volume drops when engaging, and put it back on the market at a very reasonable price so we could all get a piece of the action. It's still built like a tank and still sounds just as good as ever. The versatility of this pedal is what earns it our "Best Bang for the Buck" pick. You can get sounds ranging from the classic sweeping jet plane taking off to a subtler chorus and even the static wah pedal tone where you set a frequency and leave it there. You can create delays and vibrato. It handles complex signals like distorted guitar or multi-voice synth as well as simple single note melodies. The knob controls are pretty simple to use, and with exploration you'll discover just how versatile they are. The Manual knob lets you select the frequency spectrum being flanged, while the Width lets you control the spread of the delay sweep, often called 'intensity.' The Regen knob lets you control how much feedback you want, looping the output back into the flanger again. The Speed gives you a handle over how fast or slow you want the rate of low frequency oscillation to be. You're not going to find a more old school, classic, and reliable option. This one is built to last, just like how the ones from the 70's are still rocking! 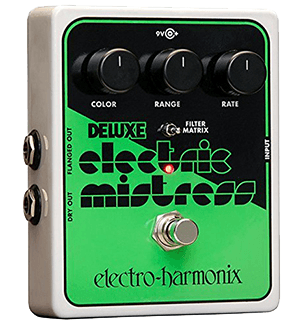 The beloved 1976 analog flanger favorite is back in the new Electro-Harmonix Deluxe Electric Mistress XO compact format so it better fits onto your pedalboard. But it also has many other upgrades, like the new die-cast chassis and some serious interior enhancements. It stays true to why the original is so loved but adds a much better power supply, true bypass switching, and a new LED indicator. It sounds just as good but with better signal integrity. You still get the thick, resonant flanger and the crazy Filter Matrix effect (controlled by the little switch above the LED). The Filter Matrix is unique to this pedal, where it freezes the sweep of the flanger so you can capture a specific moment and then alter it with the filters allowed by the knobs. So instead of the modulation you get out of flanging, you can create weird metallic resonances, hollow tones, interesting chimes, and more. Start to toss in other effects like distortion, reverb, and delays and things start to get pretty nutty. The Rate and Range knobs act as speed and frequency spread controls. The Color knob acts like a width control, letting you increase the delay between the two sides to create more whooshing or less, according to taste. When you jump into the Filter Matrix mode the Range knob changes to let you control the filter's position in the frequency spectrum and the Color knob changes the depth of the filter. Speed does nothing in this mode since the modulation is disconnected. What you're getting here is one of the all-time favorite flangers, often called the best flanger pedal ever, as well as the awesome Filter Matrix mode that you'll definitely appreciate having. You can't go wrong here. 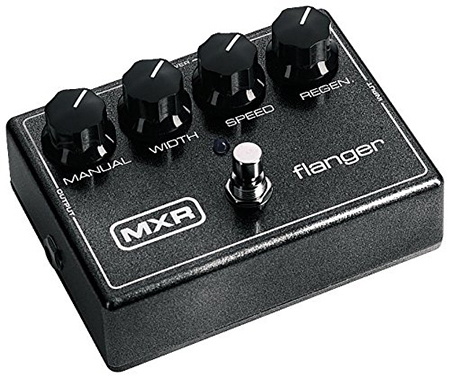 Our "Best Budget Pick" goes out to the MXR M152 Micro Flanger. Without affecting their high-quality flanging effect, MXR managed to trim out some controls and other features that aren't absolutely necessary in order to cut the price down for the rest of us who can't blow big bucks on one pedal or simply don't care about a million controls. 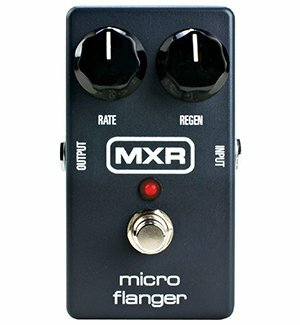 The Micro Flanger is a faithful recreation of their in-demand 80's version. It's still fully analog using their bucket brigade circuitry and still spits out an organic and very warm tone. Having only the Rate knob (to control the speed of the LFO) and a Regen knob (for feedback), you can still get all of the desired sounds like jet plane sweeps and crazy outer space sounds. I'm happy that they kept the Regen because they could have easily dropped it out too. What they did drop out was the Manual and Depth knobs, placing those values at the most desirable and often used spots. This keeps things simple while still offering tons of versatility and customizability for the adventurous guitarist who doesn't like distractions. At this price, you're not going to find a contender at the same quality. There are some cheaper ones that aren't bad, but you won't get the same value. You simply can't find a bad setting on this one, where as you can really butcher your sound on cheaper pedals with more controls. If you need an inexpensive option you can rely on to do the job without driving you nuts, you've found it. 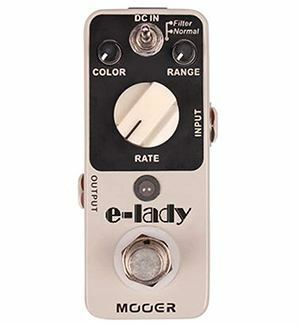 If you're looking for the absolute cheapest flanger pedal that still provides good quality, the Mooer Eleclady Classic Analog Flanger is as low as you should go. Is it top notch and comparable to the best options on the market? Of course not, but it's above average. You can definitely do worse with ones that sound artificial and too digital. Part of the reason they're so inexpensive is they're manufactured overseas. You're looking at a nano pedal made of the same sturdy metal as any other with several controller knobs and true bypass switching. The main knob you'll use is the Rate to control the speed, which is why it's big and centered. The other two are Color and Range, to control the width and center frequency placement. It also has two modes that you can choose with the switch at the top, which are Normal mode and Filter mode. Normal is what you expect out of a flanger, while Filter mode is a much more dramatic, attempting to mimic the functionality of the Matrix Filter on the EHX Deluxe Electric Mistress XO above. All in all, this company makes decent pedals based on other classics, and definitely recommended for the musician on a budget. Of all of the pedals on this list, the Boss BF-3 Flanger is easily the most versatile, as all Boss pedals usually are. It's a more evolved version of the BF-2 that had tons of loyal users. This one will too thanks to the upgrades. For one, you'll notice the separate Bass guitar input that works with lower frequency instruments. You'll also notice the Mode knob with several options, which are the Momentary, Gate / Pan, Standard, and Ultra modes. Two of these are brand spanking new. Momentary mode means the pedal is only on while you hold down the footswitch. Gate / Pan mode acts like a noise gate and sounds almost like a tremolo in mono and if you hook up a stereo output it sweeps the flanger across the stereo field, panning back and forth. Standard mode is what you expect and Ultra mode kicks that into higher intensity with far more depth. They also added a super convenient tap tempo that you can activate by pressing and holding the huge footswitch for two seconds. Of course it still comes in the classic bulletproof Boss enclosure like all their pedals. Here you get a Resonance, Manual, Depth, and Rate knob, with the Manual knob sitting beneath the Resonance one. This is a great choice if you want tons of features but don't want to break the bank on the most expensive options. You will definitely be happy with anything Boss produces. 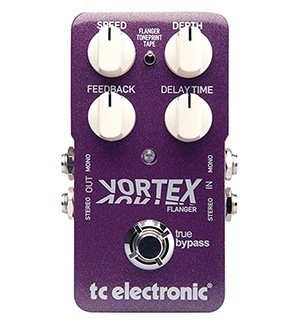 Like all of their pedals, the TC Electronic Vortex comes feature packed so you can tweak their top notch effects to your liking and well beyond. First and foremost let me mention the TonePrint technology they've added to most of their pedals. You can download presets made by professional guitarists, bassists, and keyboard players to your computer or smart phone. From your phone, you can even beam the presets to the pedal through your pickups by using Bluetooth. We've discussed all the knob types, and the ones you get here are Speed (Rate), Depth (Range), Feedback (Regen), and Delay Time (Width). This stompbox has three modes: Flanger, TonePrint, and Tape. Flanger is your standard mode and TonePrint is the one you use to access the preset you've downloaded. Tape mode is for using the classic tape flanger sound from the 60's and 70's. You'll also notice you get stereo and mono inputs and outputs. Not only is the quality of this pedal and effect fantastic, but you can turn the knobs to some pretty extreme values if that's your thing. For instance, with the Feedback knob you can dial in positive feedback like expected but you can even go with negative values too for a wildly different sound. This is another one of those "can't go wrong" options that's a no-brainer. Flanging is one of those effects that can be a very subtle, "always on" type of sound, or can be a momentary effect used in very overt and outward ways to supplement choruses, solos, or bridges. Regardless how you use it, you'll want a reliable and sturdy pedal that's built to last that produces top notch quality and tone. And that's what you get out of our list above, comprised of the best flanger pedals currently available.